Again, this is the make-from-scratch method, so just jump in at whatever stage you're at with ingredients. 1) Put chicken on to boil, if starting with raw. 3) Saute onions and peppers. 4) Once chicken is cooked through, reserve broth and set chicken aside to cool. 5) Make sauce: melt butter; add flour; stir for a minute. 6) Gradually stir in 1 1/2 c broth until boiling. 7) Lower heat; add sour cream and spices. 8) Add 1 c grated cheese, stir until melted. 10) Adjust amount of broth, spices, and cheese as necessary. 11) Mix chicken with cream cheese, tomatoes/peppers (may substitute green chilis), rest of grated cheese, salt and pepper to taste. 12) Warm tortillas so they are flexible. 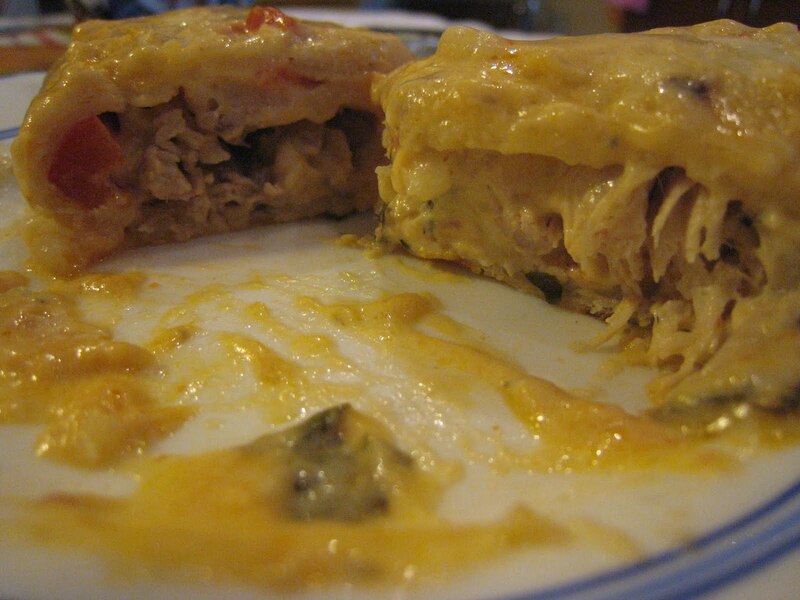 14) Fill each tortilla and place in baking pan with seam down. 15) Pour sauce evenly over top. 16) Place in preheated oven and bake for 20-25 min.